Some readings of the country’s history can be deceiving. For decades, the official line from the United Nations and the bevy of international foreign ministers and diplomats who brokered the 1991 Paris Peace Accords was that their historical document ended the conflict that had afflicted Cambodia since the Khmer Rouge launched hostilities in 1968. The problem for some journalists, academics, and those living on the ground in Cambodia is that that line never tallied with the realities of what actually happened. While the Paris Peace Accords were certainly significant for Cambodia, the country’s transition from tragic war to troubled peace actually took several more years to forge. More generally, memory of war and peace in Cambodia tends to be a more contested affair than is often appreciated, with certain aspects and dates commemorated by some more than others in line with their interests. A case in point was last week, as evidenced by the marking 20 years of peace in Cambodia with days of celebration starting December 29 dating back to 1998, instead of 1991 when the Paris Peace Accords were signed. Statues were erected, books published, and elaborate ceremonies were planned to commemorate a date in 1998 that some overlook in Cambodia’s often troubled history, marking a peace that finally arrived seven years after it was declared in Paris. To be sure, the 1991 Paris Peace Accords achieved much. They paved the way in for peacekeepers with the UN Transitional Authority in Cambodia (UNTAC) in 1992, enabled democratic elections a year later, and injected much needed billions into a failed economy. But the problem for supporters of the Paris Peace Accords was that UNTAC failed to disarm the genocidal Khmer Rouge and – as unfathomable as it sounds – negotiations were underway for their inclusion in the future political landscape. There was no peace and a low-intensity civil war continued after Prince Norodom Ranariddh of Funcinpec won the 1993 ballot and became First Prime Minister and entered a power sharing arrangement with Second Prime Minister Hun Sen of the Cambodian People’s Party (CPP). Both sides armed-up and the relationship between the pair turned acrimonious, resulting in a major showdown in mid-1997 – described by some as a coup, others as simply another battle in a long running conflict. According to CPP Honorary Chairman Heng Samrin, in his recently released book Cambodia Reborn, Ranariddh was preparing to cut a deal with the Khmer Rouge hoping to combine military forces in an effort to outgun Hun Sen, triggering viscous response. Old scores were settled, hundreds were killed and Ranariddh was routed. His father King Norodom Sihanouk then pardoned him and offered Khmer Rouge cadre amnesties in return for their defection as government troops pushed into the northwest and surrounded what was left of Pol Pot’s strongholds along the Thai border. Surviving Khmer Rouge leaders Nuon Chea and Kheu Samphan, recently convicted of genocide, surrendered on Christmas Day, 1998, the final shots were fired on December 28, and the Khmer Rouge formally surrendered a day later when Hun Sen met with both leaders at his compound outside of Phnom Penh. That historical take doesn’t always sit well with the well-meaning supporters of the Paris Peace Accords, who insist the war ended with its signing. The military realities are often ignored, along with the fact that they were born out of a peace deal that failed to disarm the Khmer Rouge. Instead, face-saving declarations that the events that followed their signing were simply illegal and a violation of the accords were common. That is neither reasonable or fair, and insulting for the soldiers who fought and died while dealing the final blow that ended the maniacal Khmer Rouge. Many at that time feared final surrender would simply prove, like the Paris Peace Accords, to be another false dawn. For years, speculation persisted that the Khmer Rouge were still armed and ready, but those suspicions were finally laid to rest by the genocide trial. 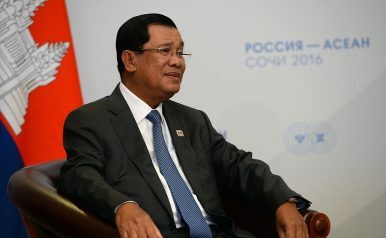 Cambodia has a long tradition of commemorating military anniversaries, including Pol Pot’s victory over Lon Nol forces in 1975, the Vietnamese invasion that ended his slaughter, end of Vietnamese occupation ten years later, the signing of the Paris Peace Accords, and even Pol Pot’s death eight months before his chief lieutenants formally surrendered in Hun Sen’s compound. And unsurprisingly, those are remembered differently by different actors, and their meaning has evolved with time. But among these, it is striking that the Khmer Rouge capitulation before Hun Sen on December 29, 1998, was a date less emphasized among international observers in particular, in part because it was overshadowed by the historical significance attached to the Paris Peace Accords. Of course, remembering that date comes with its own series of questions, including the nature of Cambodia’s troubled peace and Hun Sen’s governance of the country. But given that it did mark the start of two decades of a sometimes troubled peace, and given this country’s tragic history at war, surely it is worth some attention. And if part of understanding history rests in comprehending how various groups of people interpret the past – no matter how selectively – we ought to look at the dates that are given significance in the countries themselves in addition to those by outside actors. Prime minister's outburst follows warnings of war if his party loses elections.